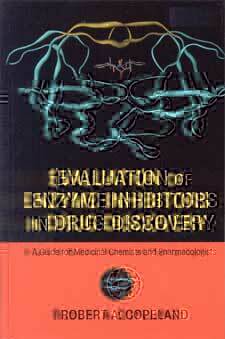 Evaluation of Enzyme Inhibitors in Drug Discovery provides readers with a thorough understanding of enzyme-inhibitor evaluation to assist them in their efforts to discover and optimize novel drug therapies. Key topics such as competitive, noncompetitive, and uncompetitive inhibition, slow binding, tight binding, and the use of Hill coefficients to study reaction stoichiometry are all presented. Examples of key concepts are presented with an emphasis on clinical relevance and practical applications. What opportunities for inhibitor interactions with enzyme targets arise from consideration of the catalytic reaction mechanism? How are inhibitors evaluated for potency, selectivity, and mode of action? What are the advantages and disadvantages of specific inhibition modalities with respect to efficacy in vivo? What information do medicinal chemists and pharmacologists need from their biochemistry and enzymology colleagues to effectively pursue lead optimization? Beginning with a discussion of the advantages of enzymes as targets for drug discovery, Evaluation of Enzyme Inhibitors in Drug Discovery then explores the reaction mechanisms of enzyme catalysis and the types of interactions that can occur between enzymes and inhibitory molecules that lend themselves to therapeutic use. Next are discussions of mechanistic issues that must be considered when designing enzyme assays for compound library screening and for lead optimization efforts. Finally, the publication delves into special forms of inhibition that are commonly encountered in drug discovery efforts, but can be easily overlooked or misinterpreted. Evaluation of Enzyme Inhibitors in Drug Discovery is designed to provide a solid foundation in enzymology and its role in drug discovery. Medicinal chemists and pharmacologists can refer to individual chapters as specific issues arise during the course of their ongoing drug discovery efforts. Why Enzymes as Drug Targets?